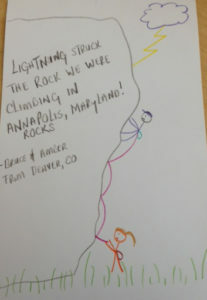 A visitor's contribution to the "Tell Your Weather Story" wall. A new exhibit exploring the power of weather and the stories behind it opened earlier this month at NCAR’s Mesa Lab in Boulder, Colorado. Spark, the group that oversees science education at UCAR, created the exhibit with input from scientists, engineers, designers, and writers. The NCAR Weather Gallery joins existing exhibits like an eight-foot-tall tornado, a microburst generation tank, and a display that shows current wind speeds measured on top of the building. One of the new features is the interactive, “Tell Your Weather Story,” which gives visitors the opportunity to describe and post their own experiences on weather. It took about 20 months to plan and develop the exhibit from start to finish. To begin the process, an advisory committee met to decide what topics the exhibit should cover and what they wanted visitors to experience. They came up with a plan that included five content sections and several different ways of delivering information, which included hands-on interactives, large mural photos, panels with pictures and text, and touch screens with games and videos. Since the exhibit opened on 10 October, the Mesa Lab has had approximately 2,000 visitors, with at least half that number spending time in the exhibits. About 15,000 people a year attend scheduled programs at lab, including 10,000 K-12 students and teachers who take classes and go on tours, as well as 5,000 in special groups and public tours. “People are really excited about the new exhibit. Visitors love all of the opportunities to play with the hands-on stuff, and it’s been fun to see groups of visitors interacting with each other as they explore different parts of the exhibit,” says Becca Hatheway, NCAR exhibit manager. 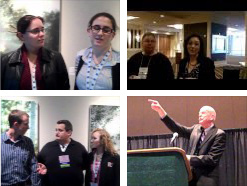 “UCAR and NCAR staff members are also excited to see something new in this space. I’ve seen just as many staff spending time in the exhibits as I have seen visitors. So I guess we’re all excited to learn more about the weather.” The visitor center at the Mesa Lab is open to the public year round and offers free exhibits about weather and climate, a gallery featuring local artists, an outdoor weather trails, and more. For more information visit the Spark web site.